When suiting cloth comes off the looms and is washed, it feels surprisingly rough, like thin cotton khakis. It is the finishing of the cloth that gives it the touch and the handle we expect. It reveals the potential of the cloth, first, and can then create different finishes on top depending on what the customer wants. 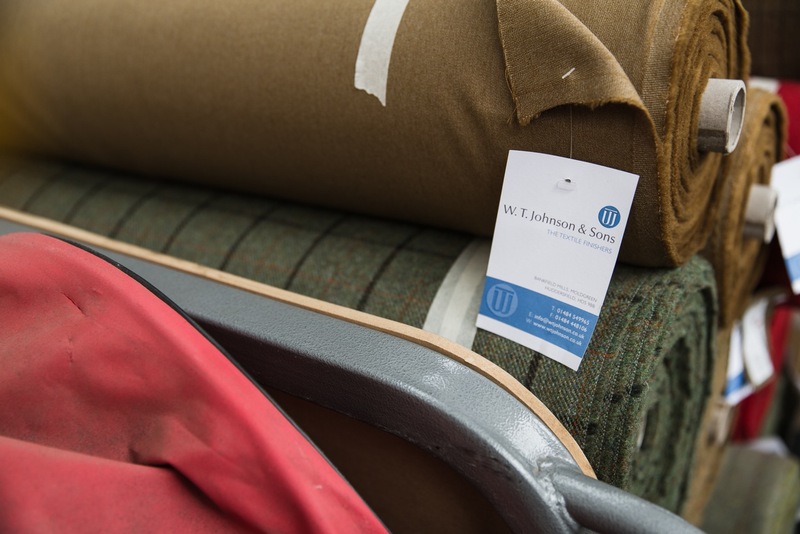 The finest finisher of suitings in England is WT Johnsons in Huddersfield, which I visited a couple of weeks ago. Unusually for the players in Yorkshire that I am covering in this series, Johnsons has a very good and informative website. It runs through the finishing process and explains several of its specialist finishes. Broadly, though, there is wet finishing and dry finishing. 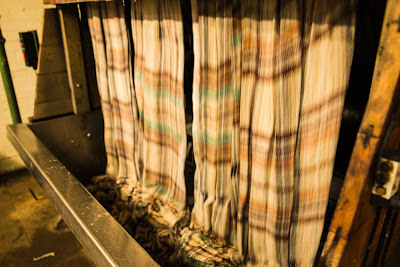 The first involves washing the cloth with a varying amount of solution (the liquor) for a varying amount of time, the length depending on the cloth and the effect desired. 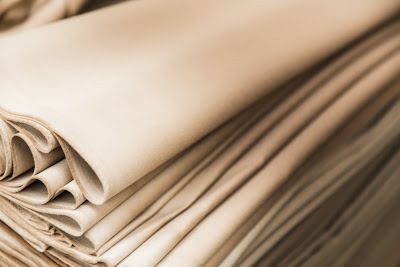 Generally, the longer the washing or milling, the softer the cloth will be. The pressure also affects the finish – the heaviest being a ‘blind’ finish, so called because you can no longer see the weave of the cloth. The liquor creates a slightly nauseating smell – something that doesn’t come across in the images. 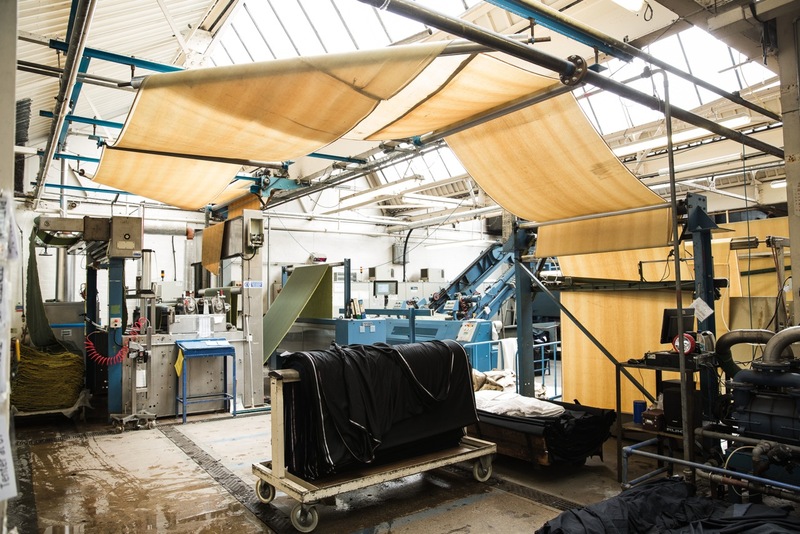 Tanneries are definitely the worst for smell, but a quick tour leaves you slightly lightheaded by the end. The cloth is scoured, again with water, dried and then moved upstairs to the dry finishing. 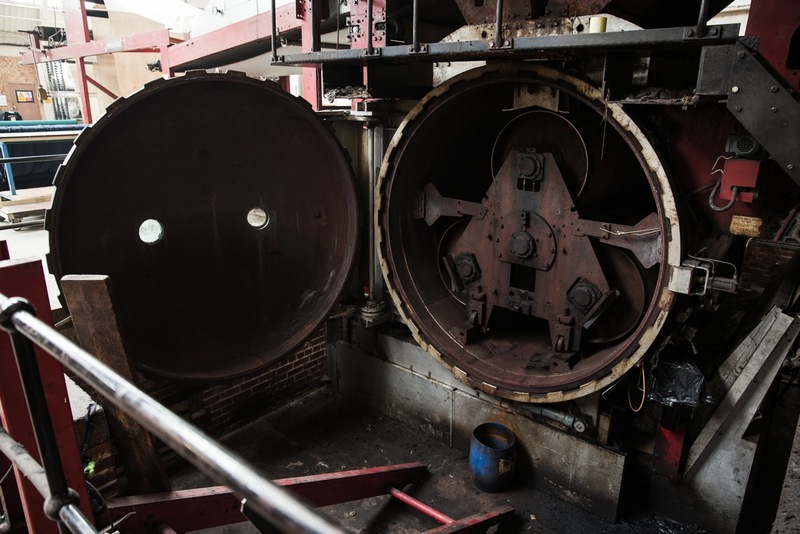 Johnsons is a rather crowded facility – the drying machine curls around the walls and the ceiling in order to fit into the space available. They’d love to move, but have access to their own supply of water under the building, which is crucial to controlling the process. 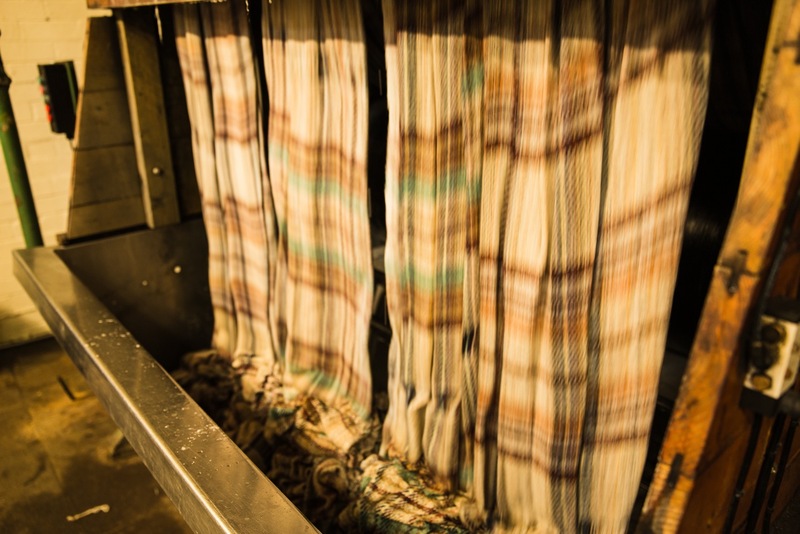 The water is softer than in the south of England, which is one reason cloth is often woven elsewhere (eg at Fox in Somerset) but brought up here for finishing. Next the cloth is decated – rolled with steam, to set the finish – and cropped down to the desired nap. Most cloths use blades, like a big lawnmower. Mohair has to be singed off, running it over a hot plate. 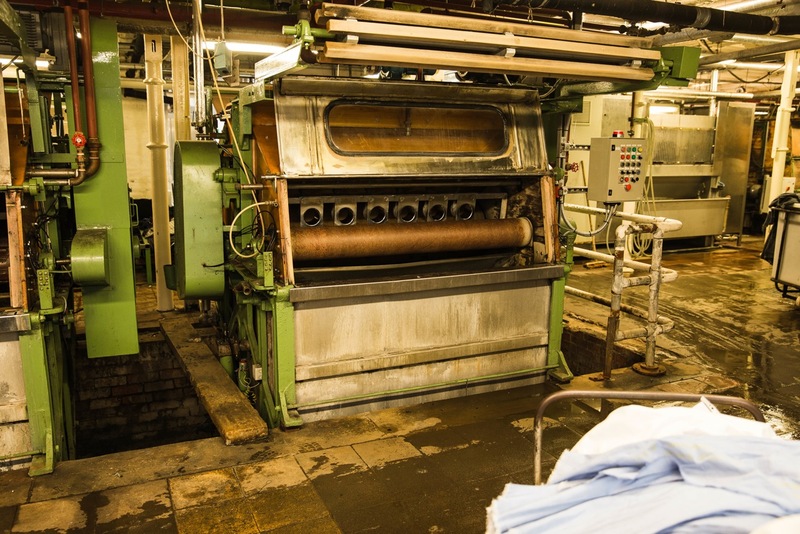 Johnsons also has the only two continuous decating machines in the world. Most finishing machines look very similar. They are as wide as a double-width piece of cloth and 8-10 feet high. Cloth goes in one end and comes out of the other; you can’t see much of what goes on inside. But the continuous decating machines are different. They are huge, hulking things, reminiscent of industrial steam engines. A big roller in the middle is sunk into the ground, itself bigger than most of the other machines. Again, there’s steam and pressure and you can’t see much of the process. But the things themselves are mighty pieces of engineering. 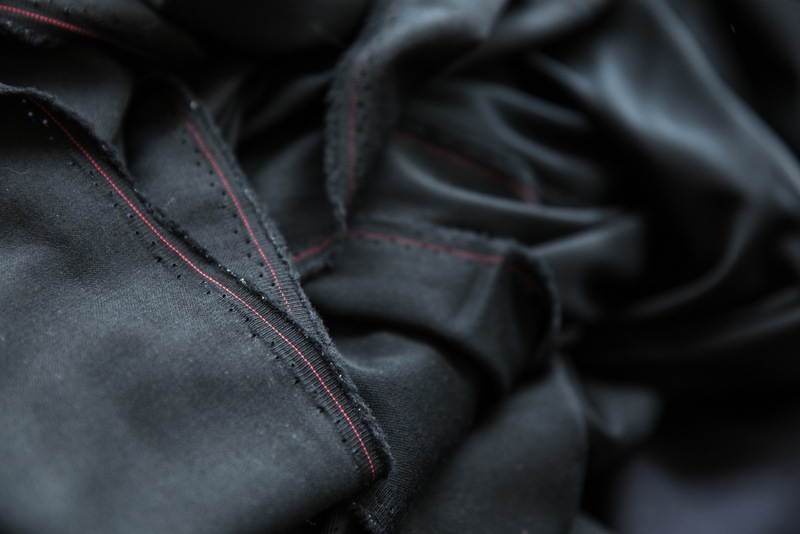 Everything after the cropping is an extra finish – mostly involving steam and pressure – that can make a material feel rougher or perhaps distressed. Finishes on top of the cloth, aimed at repelling water or sometimes odour, can also be added. Finally, Johnsons is bringing back London Shrunk, an old process that used to be done on all high-end cloth. It is left to sit in a slightly cold and damp room, and shrinks slightly – settling. Some of the merchants that still have the facilities do something similar, often letting their cloth sit in the basement for days or weeks before delivering it. When I mentioned to Lee and Davide at Gieves & Hawkes last week that I’d been to Johnsons, their first question was whether they still did London Shrunk. They said one of the problems with modern cloth is that it can shrink when the tailors start working with it (both trained as tailors). They can stitch it one day, and when they come in the next day the stitching is all puckered because the cloth has shrunk. Davide suggested it is because cloth manufacturing is now such an efficient and accelerated process that cloth is never allowed to just sit anymore. When he started at Kashkett’s, the cutters would often strike a jacket, lay it on the pattern and leave it there for a day, to let it settle in the same way. You can follow the discussion on WT Johnsons – finishers, Huddersfield by entering your email address in the box below. You will then receive an email every time a new comment is added. These will also contain a link to a page where you can stop the alerts, and remove all of your related data from the site. I will use this as an excuse as to why some of my suits no longer fit as well as they used to, I haven’t gained weight, the wool has shrunk!! Would you say that finishing is a dark art or a precise science? Hmmm. A precise science in that the results can be closely controlled and are predictable. But a dark art to those looking in in that it’s hard to see how washing and pressure can create so many different effects? Is it fair to say, then, that it’s only the finishers who need the science? Fascinating stuff btw. Reminds me a little of ye olde vinyl mastering process. firstly thank you for such a rich and dense storehouse of information..it is probably the best of its kind anywhere. I would like to ask a question or two; firstly I have seen pictures of a green tweed suit that you had made (Made to measure?) but after much looking I can’t find the article/picture. Also, and perhaps I have missed this, but the ‘Blogger’ search window at the top seems intermittent (= back to Google search). Finally, I understand that you have many questions put to you but any chance of a question box (a la TUMBLR) to enable direct questions rather than having to use the comments box. Hope you don’t mind the last two, frankly I’m amazed at your output given the level of research you do. Thanks again. On green tweed, I had a suit made at A Suit That Fits ages ago, but I wouldn’t really recommend that. There was also a pale green jacket from Cifonelli and a green jacket my wife was having made at Kathryn Sargent. I’ll check the search window, thanks for letting me know.